Today is a good day for the people of Colorado. It was a little over two months ago that the Colorado legislature passed SB-252 to increase the renewable portfolio standard of large rural electric co-ops (more details on the bill here). All we were waiting for was the good governor's signature. Well, today Gov. Hickenlooper signed the bill into law! It wasn't a perfect bill (is there any such thing? ), but the people of Colorado should be proud that their state is putting itself on a path of not only cleaner air, but more jobs and more glorious renewable energy. Thanks to our Colorado legislators for doing what's right for its constituents. Colorado Public Utilities Commission (PUC) for 550 more megawatts of clean renewable wind energy. The driving force behind this request for more wind power? Well, you have to thank Congress for extending the wind Production Tax Credit for two more years. This tax credit is going to keep wind industry jobs intact and wind power increasing across the land. Also, the tax credit keeps the cost of adding all of those megawatts low for Colorado customers. Kudos to Xcel and kudos to Congress for making clean energy a possibility for a least a couple more years. Let's hope the PUC passes Xcel's request. It's been awhile since my last post and I apologize. Much of my free time has been dabbling in worlds of Twitter / Facebook / Google+. How I've neglected you dear Denver Sun Sponge readers! Well, I do have something exciting to tell you about, which came to me through the good people at Alliance for Sustainable Colorado. Colorado Senate Bill 252 was introduced last week and if passed would require large electric cooperatives (with +100,000 meters) to increase their renewable portfolio standard (RPS) to 25% from 10% by 2020 as well as requiring 1% of retail sales to come from distributed generation (DG) sources. Colorado's current RPS requires investor-owned utilities (IOUs) in the state to generate or purchase enough renewable energy (RE) to supply 30% of their retail electric sales by 2020. In addition, IOUs must have 3% of their retail sales from distributed generation (DG) sources. The current Colorado RPS also mandates that electric co-ops and municipal utilities serving more than 40,000 customers need to generate or purchase enough RE to supply 10% of their electric sales by 2020. There is no DG requirement for electric co-ops and munis in the current RPS. For more information on the Colorado Senate Bill 252 please check out the Power of Wind's backgrounder (as of this writing Senate Bill 252 was not posted to the Colorado General Assembly website). If you would like to express your support (or opposition) to your Colorado elected officials about this bill then please head on over to the Alliance for Sustainable Colorado website to learn how to contact them. Thanks for reading and supporting a more renewable, efficient, and sustainable Colorado! The Colorado Senate approved the bill. Rural electric co-ops with more than 100K meters and utilities that generate and supply electricity for electric co-ops need to acquire 25 percent of their electricity from renewable sources by 2020. Here's more info from the Denver Business Journal. Is this good for Colorado? What say you dear readers? As sustainability practitioners we are used to banging our heads against the wall. We wonder why our bosses and colleagues don't "get it". We are dumbstruck by those that refuse to make a profit and still do good. We shake our heads at the refusal of people to think about future generations on the planet and what the world will look like if we propagate 20th century behavior in the 21st century. Yet we plug away, and continue the good fight, full of frustration, but somewhat satisfied with progress, albeit minimal. If we'd like to see sustainable behavior take root faster (and reduce the amount of headaches we have), then this article titled, "Overcoming the Seven Sustainability Blunders" by Bob Doppelt is a must read. I've heard of some of the blunders before, but there are a few new ones that I had never contemplated. Mr. Doppelt not only lists and describes the seven blunders, but he also provides ways to resolve the blunders through "interventions". There's a ton of information to digest in this article, so take it in slowly and deliberately, because it's critical that we begin to mitigate our blunders. About six months ago we resurrected a dormant green team at the company I work for to expand the focus to the triple-bottom line - people, planet, and profit. One of our initiatives is to reduce water and energy consumption as well as divert as much as we can from the landfill. These initiatives not only reduce the company's greenhouse gas emissions (GHGs), but they also save the business money. If you are a small business trying to be more sustainable, embracing the principles of the triple bottom line aren't difficult or cost prohibitive. Most of these green tips are just a matter of behavior change. So, what say you dear readers? Are you ready to start a green team at your company? This should be music to all of our ears. According to the Tracking the Sun report by the Lawrence Berkeley National Lab the cost of residential and commercial installed solar installations dropped 11 to 14 percent from 2010 to 2011. Of course the larger the solar installation (like utility scale solar plants) the cheaper the price. These sinking prices will only help the adoption of renewable energy technologies by both home-owners and businesses alike. Can you imagine a lower and lower capex spend in addition to never paying for electricity again and reducing your carbon emissions? I certainly can. The Comfort Cowboy is one unique individual and we're lucky to have his presence here in Colorado. Frankly, we need more folks like him on the planet. This cowboy has the mind of a scientist and the spirit of a shaman. Energy efficiency is his raison d'être and he wears his lust for building science on his sleeve. Comfort Cowboy's goal is to not only save you money from increased energy efficiency, but to also increase the level of personal comfort in your home. We don't have to freeze in the winter and roast in the summer while paying a fortune in utility fuels costs. So check out this interview and learn a bit more about building science, "project net zero", 7th generation responsibility, and how to save yourself from chopping too much wood in the winter. The American Council for an Energy Efficient Economy (ACEEE) released their report ranking states by energy efficiency (via Triple Pundit). Massachusetts received the number one ranking for the second year in a row. Colorado didn't make the top 10, but is getting ready to knock on the door with a ranking of 14. 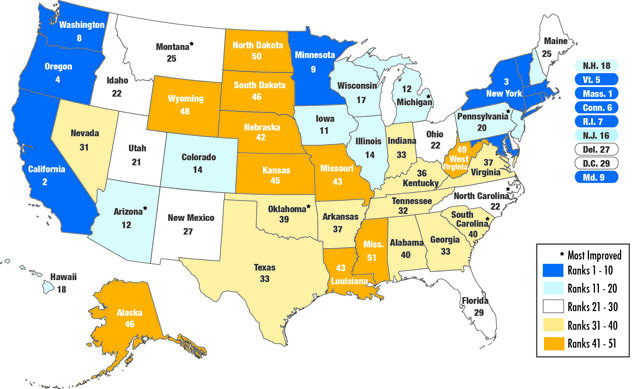 Kudos to Oklahoma, Montana, and South Carolina for being the most improved states for energy efficiency. Per the ACEEE website the report "examines six of the primary policy areas in which states typically pursue energy efficiency: utility and “public benefits” programs and policies; transportation policies; building energy codes; combined heat and power (CHP) policies; state government-led initiatives around energy efficiency; and appliance and equipment standards." Energy efficiency has the ability to make a large impact towards reducing our carbon footprint, increasing our personal comfort, and saving money on fuel costs. 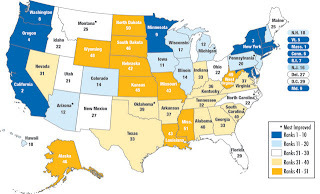 If you live in some of the states that were at the bottom of the rankings, don't fret, you can help move your state up the rankings by working with the electric and gas utilities in your state, local government, and your public utility commission. Better late than never. It's good to see graywater systems gaining some traction on the Front Range in Colorado. We experience low humidity levels, and even though the mountains supply us with fresh water from the snowpack, the last decade or so the Front Range has seen more frequent bouts with drought. We cannot take water for granted here. But strict water laws disallow individuals from preventing the water they use from "going downstream". But it looks like the folks at the University of Colorado at Boulder might have a method to reuse water that is within water rights law. One of the dormitories on campus is going to do a five-year pilot to collect graywater from showers and sinks, filter it, and then reuse the water in toilets. After the water is flushed it goes back into the system, treated, and then sent on it's way downstream. The folks downstream get the water they are owed just a little bit later. The university will study the dorm's graywater system and then report the findings. This will let us know if a system like this is viable within current water laws. Imagine this type of system in every residential and commercial building in the United States. Think of how much fresh water we could save? Delicious. 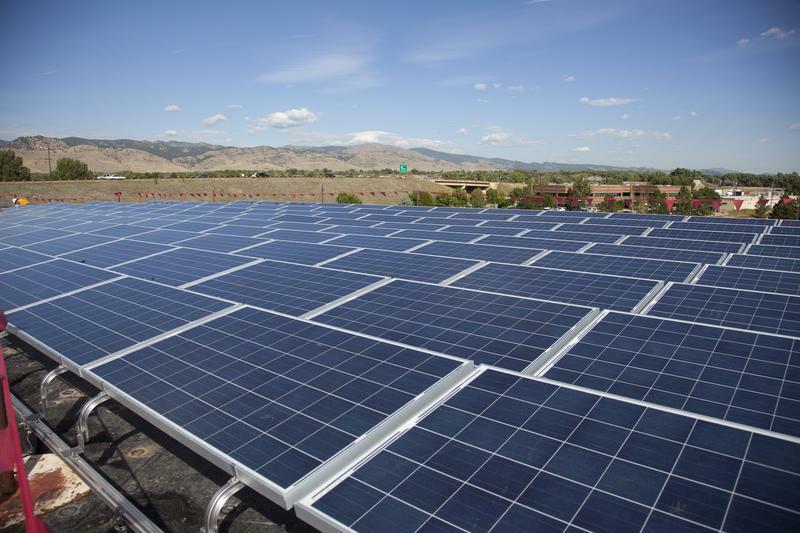 The first solar garden in Windsor, Colorado has popped up to feed the community with clean renewable power. Solar gardens are gaining steam across the country. These gardens are essentially a mini renewable power plant that people can buy into - people that are unable to purchase solar power on their own property for whatever reason, whether it be that they're renters, there are too many trees shading the property, or a homeowner just cannot afford the upfront capital outlay for a photovoltaic system that can meet their electricity needs. Solar gardens are just one piece of the proverbial renewable energy pie that this country must adopt on the road towards independence from fossil fuels. I'm happy to see that these are taking off in sunny Colorado and have been given a boost with the solar gardens law that Colorado passed in 2010.